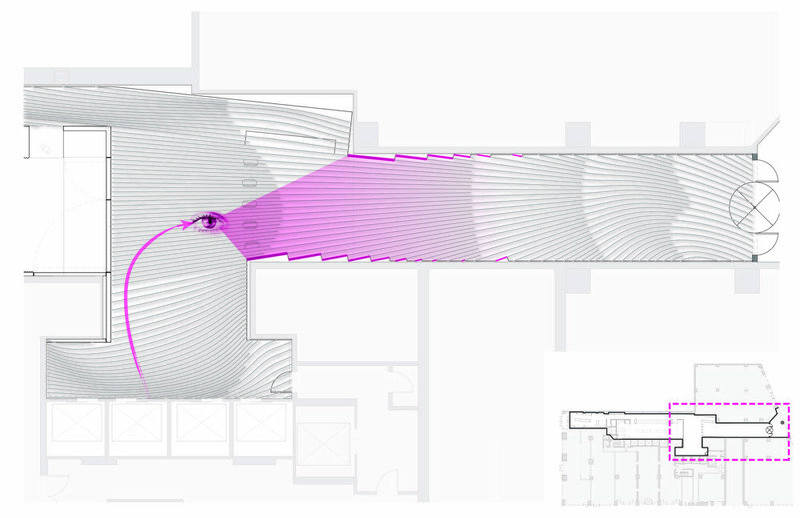 Young Projects’ competition proposal for the Universal Music Group lobby renovation sought to harness the optical principle of anamorphosis in a contemporary architectural design. A superscaled version of Universal’s logo immediately greets visitors to the building. This signage is gradually revealed to be singularly focused to the building’s entry and dissolves into abstracted graphic markings as visitors move throughout the space. On the ceiling, gently curving plaster fins reinforce the lobby’s perspectival focus and act as diffusers for concealed lighting and mechanical systems. The open circulation of the lobby space is anchored by a glass-clad central cafe serving multiple programmatic functions. Flexible seating and partitions allow for the space to be configured as a venue for intimate musical performances, press conferences, record release events and other events hosting clients and the public. 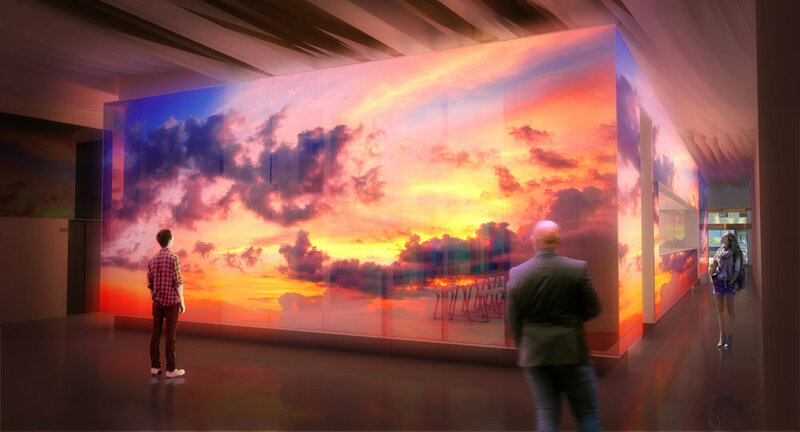 A coordinated system of digital projectors activates the translucent glass skin of the cafe volume and transforms the understated architectural partitions into a canvas for immersive digital media displays. The Universal Music Group proposal is the result of collaboration with interior designer Doreen Chambers.